As I'm wont to do, I criticized Microsoft's new branding. So instead of just bashing them, I thought I'd post my own interpretations. Their new logo is boring. It lacks energy. That's the problem with squares. They are rigid, upright, implying immobility. Microsoft is not a utility company. I don't think they want to communicate that. So, the first option is to simply shift the square into a rhombus. It's alive. It has energy. It has motion. Importantly, it's more than four squares arranged in a bigger square. The increased complexity adds personality. It makes the "face" more identifiable. I think that the shifted square is closest to where they wanted to go. I am 100% sure that they experimented with this logo internally. Hell, it took me three minutes of playing around to create these different versions. It's puzzling as to why they didn't choose it. I think it's better. The other logos are just me playing around, showing what I mean when I say "identifiable." All of those geometric arrangements are more unique, less commonplace. They have more character to them, allowing that shape to be associated with Microsoft. The four squares is so common, that even with a massive brand effort, I doubt that Microsoft will ever be able to associated the company with the shape. Indeed, the blatant "unification" of the Metro interface with the overall brand is actually a bit ham-fisted. The sort of bland logo is in that sense simply a manifestation of a hodge-podge company, trying hard to create some sort of "unity" out of something that shouldn't be unified. Synergy is not a thing, gentlemen; it is a catchphrase used by those who don't actually understand business. And just for fun, more new Microsoft logos. Microsoft's New Logo And Branding Is... Good. Microsoft has gone and done the unthinkable; they have released a new branding. I can understand why they did it. While Microsoft's brand is far from bad — I would go so far as to say its mostly great — it's pretty staid. It hasn't been exciting in a very long time. I would blame that on product, but Microsoft actually has a fair amount of stuff that's pretty exciting. Windows 7 and Xbox are both very dynamic products. I would say that the problem has been that Microsoft has been slow as hell in releasing those exciting products. The Xbox is six years old, and Windows 7 is only an OS. Microsoft doesn't release something shiny every year like Apple, nor do they have dozens of wacky public experiments in the wings like Google. The best they have are their accessories, the vast majority of which look like something for the "soccer mom" crowd or are soundly beaten both in style and functionality by Logitech and Apple. Microsoft does have an ace in the hole, though, and that is its apparent dedication to finally getting into the hardware game. Microsoft has, in many ways, been hamstrung by its OEM's. Their aggressive price-cutting allowed the growth of the PC industry and allowed Windows to utterly dominate the computing world. Both were good things for Microsoft and for the consumer. Unfortunately, after years of price cutting, those same OEM's appeared to forget how to make, I dunno', good products. They turned into a low-quality boat anchor that was doing active harm to Microsoft's brand. If they had been willing to make higher quality gear, this may not have been the case. But those companies, like so many other companies, were run by idiots. So after over a decade of sub-standard hardware being upstaged at every turn by the stuff that Apple makes, Microsoft has gotten tired of it. Their upcoming line of tablets looks great (frankly, I've felt that Microsoft should have been making a "reference" line of hardware for the past fifteen years). Still, even though I am always about product over branding, I think that a branding change was a good idea. 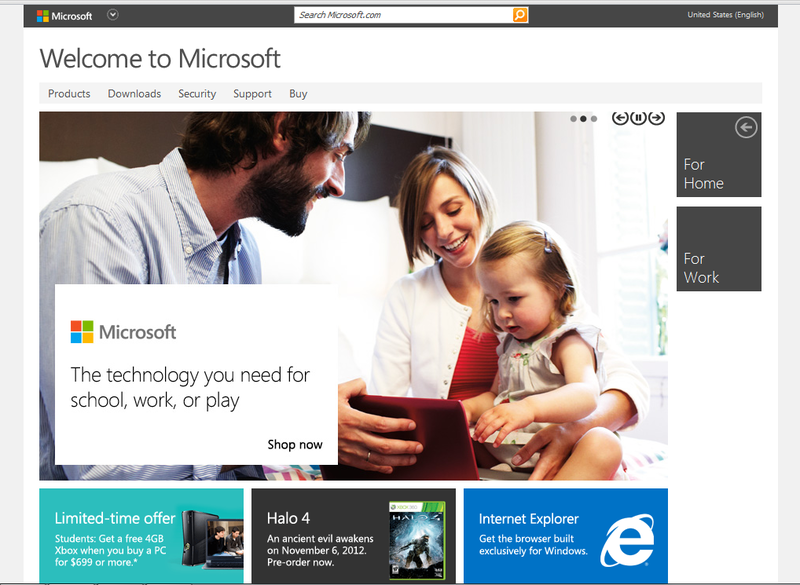 Microsoft, even in the younger minds of today, represents "old" tech. Apple I think is exempt from this because they crossed the rubicon of ruin in the 1990's, to be reborn in the early 2000's as a "new" company. Aside from Apple, Microsoft is much older than every one of its competitors. Moreover, Microsoft's old logo, if taken on purely aesthetic terms, was old. All of the details of its creation scream 1990's PC world. That said, I wish that Microsoft had gone with something a little less... corny. They want to inject unity into their brand, which is fine, but that unity should communicate something exciting. This brand is tearfully boring. They shouldn't simply copy Apple and go with the polished "futurey" look, but this branding looks like the design and colors used by an educational toy company. I like the minimalist, flat look. I like the airy expression of colors and layout. I like that this logo is a bit more "friendly" and "approachable" than the old, more corporate logo. But it's still lacking any bite. Apple thrives on the feeling that people are living the future. Microsoft can't have that, nor does it want that. They want to be easy, reliable, and everday-tech. I think that they were going for that, for an "appliance" look, but were too timid to go all the way. Being an appliance is the antithesis of cool, but it is precisely what many people want. I dunno'. Perhaps that's a strength of the brand. It's such a non-entity that Microsoft is hoping that people will inject their own interpretations of the brand into it once they interact with some of the new product coming out. Truly, this brand has very little in it. It's embodied in the three squares that rely on color for their differentiation (never a good idea). There is zilch in this identity that stands out. A brand should be a "face" that is recognizable in the sea of other "faces." That means that the goal of a logo is to be an attractive, but most importantly unique face. Why did Paul Rand add circles to his Westinghouse logo? Because they made it look different. No other reason. Microsoft is so huge, almost any brand can be well-implemented simply because of the company's ubiquitousness. But the brand needs to be unique. This brand is not unique. In fact, it's rather lost in the sea of other tech companies. Because of that, even though I know that Microsoft will make it work, I suspect that they will find themselves changing it in the not-too-distant future. I have an issue with the design itself. Using primary or near-primary colors in straight lines on a display is always problematic because of sub-pixels. They make colors next to each other appear shifted. This is not something that you can only see if you look close. The image will look "off" even at ordinary viewing distances. The higher the resolution, the less this effect is seen, but the most popular resolution out there right now is 1280x800 (my resolution), and I saw it very easily. Obviously, a screen capture wouldn't work, so I took a photo with my camera so you can see the effect of which I talk. It's not elegant at all.